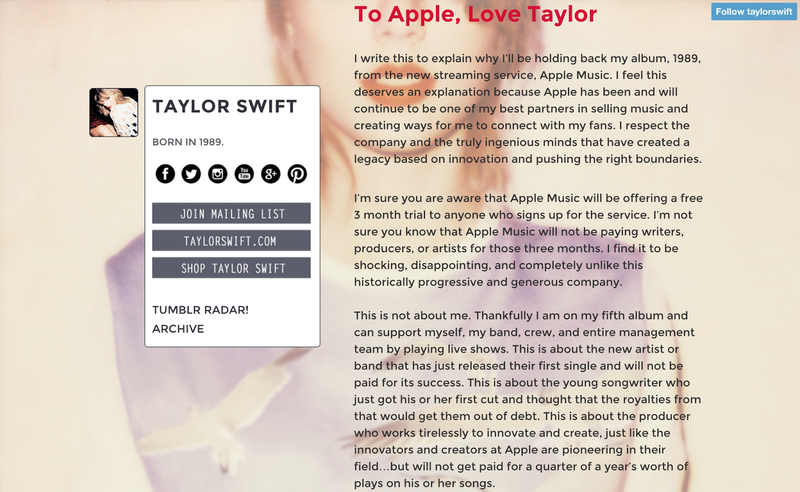 By now I am sure you heard yesterday Taylor Swift posted an "open letter" to Apple about their upcoming streaming music service. In summary, Apple Music will rival Spotify and for around $10 a month you will get unlimited streaming access to most of the popular music in the Western world. Apple Music supposedly will give artists a little bit more per stream than Spotify does, but this compensation will still really only be pennies (or fractions of pennies). I have said before I think Spotify is the devil, but maybe all streaming music is the devil? One of the promotions Apple was going to offer was that their new service would be free for three months. Which meant that for three months the artists whose music was being streamed would not be compensated. This would be especially damaging to any artist that was releasing new music during that three month time period. This sickened me, and thankfully Taylor Swift had the same reaction. But Taylor Swift actually has a voice because she is the most popular musician in the world right now. So unlike the 100 people that will read this post, thousands read her letter (edit: a few hundred people have read this now). Swift does not allow her music on Spotify, which is a decision I have praised previously. Essentially what that means is that you have to buy her albums in full, either on iTunes, Amazon, etc. and either as digital downloads or in physical format. I actually bought 1989 as both a digital download (pre-ordered), and then later I bought it again on vinyl because the album is that good. Now I assume Swift plans to allow her music on Apple Music, yet still not on Spotify. Unless Apple's artist compensation model is MUCH better than Spotify's, this seems hypocritical to me. If Swift really opposes streaming music services (with negligible artist-payout models), then she should boycott ALL of them. Swift and I see eye to eye on Spotify being the devil, but does she share my new expanded music that all streaming music is the devil? Swift is not the only popular artist who has boycotted Spotify. Radiohead has also kept some of their music (All of their music? I don't even know because I refuse to create a Spotify account) off the service for the same reasons. Not only do they object to the model industry-wide, they want fans to buy their music directly from them. This is the band that self-released an album online and you could literally pay whatever you wanted to the band to download it in 2007. They made millions of dollars off this model and got 100% of the profits. Of course, it was their 7th album and they were arguably the most popular rock band in the world when they pulled off this experiment. Now, part of me wants Taylor Swift, Radiohead, and all of the popular artists in the world to boycott all streaming music. Like has been discussed, this is not how these artists are making their living, and their is no reason for them to use these extra services. If Taylor Swift were to only sell her music on her website, everyone would go there to get it. If hundreds of artists pulled their music from Spotify and Apple Music, eventually these services would no longer exist because consumers wouldn't subscribe. However, there is a much better solution to this problem. The problem is not with the musicians; it is with us: the fans and consumers. We are lazy and cheap. What is music worth? What is one song worth? What is an album of 10 songs worth? Those questions have been answered for decades by record labels and the industry, and if we allow those entities to continue to determine the value of music, it is going to be worth less and less because the labels and industry are pouring all their resources into streaming services. When you pay a monthly subscription fee to a streaming service, you are paying for the convenience, not for the music. It is simple for you and all the music is in the same place. But you are not paying for the art, as there are many other ways to listen to that same music. The money you pay, for the most part, is going to the service or a record label. 99.99% of your subscription fee is going to a corporation of some kind. And the minuscule percentage that is left over is so small that some artists would rather you steal the music or just use YouTube to listen because that way at least the corporations aren't getting the bulk of your money. Derek Webb, musician and founder/owner of NoiseTrade, has publicly stated he would rather you illegally download his music for free than subscribe to Spotify. NoiseTrade is an interesting model because you can legally download music for free by providing your ZIP code and email address. You have the option to "pay what you want", and this money goes almost entirely to the artist or to a charity they have chosen. However, as Derek Webb has explained, you should not feel guilty for entering a "0" in the donation box because your location and contact information is very valuable to the artist. Derek Webb, like Taylor Swift, makes most of his money off touring and playing his songs live, not selling albums. However, artists can make money off selling albums. But they key is us fans and consumers buying, not streaming, the albums in full. There are lots of ways to do this. The best way out there right now--for both fans and musicians-- is Bandcamp. Bandcamp provides a variety of services to artists, but essentially it is a store front for buying music. Primarily it is a way to buy digital music, but artists can also sell their physical music on the site, such as vinyl or CD's. But, what makes it special, is that it also provides streaming services based on the artists' preference. Meaning that each musician on Bandcamp can select how many of their songs you can stream (sometimes maybe 3 of the 10 tracks), and they can select how many streams you get. For example, recently I discovered a new band on Bandcamp and I was able to stream the album three times for free and then I either had to stop, or pay for it as a digital download. I payed the $8 and downloaded the music. Why else do I care? Because I love music and I find great value in it. I think a great song is worth at least one dollar. I think a great album is worth at least ten. If an album really connects with me, I have no problem paying $20 or more for the vinyl release because it is WORTH it. 1. Cancel your Spotify subscription. After all, Spotify is the devil. 2. Don't subscribe to Apple Music (and don't use the free trial). (There is an opposing view that Apple Music will be good for indie artists. However, most are recommending indie artists not sign up for it.). 4. Start using Bandcamp and figure out which artists you like are on it. If they artist isn't on Bandcamp head over to Soundcloud because at least there you can preview full songs rather than the clips on iTunes or Amazon. 5. After you discover music you like, commit to buy the WHOLE ALBUM. Bandcamp or the artist's website is preferred, because they get most all the profit. 6. If the methods in step 6 don't work, use a larger retailer like Amazon or iTunes, and buy the full album; either as a digital download, CD (sometimes the same price as the digital download, plus you get the artwork, which is hopefully great) or vinyl. 7. Go back in time (pre-2000) and go to an awesome record store and buy CDs, cassettes, or vinyl records. Actually, stores like this still exist! Here is the best one I am aware of. 8. Go to a concert and buy merch! This is by far the best way to support an artist. I discuss this in much more detail here. July 23 update: After discussing this post with many, I do think there is one way Spotify, Apple Music, etc. could work. I mentioned it briefly when describing Bandcamp; the key is for those services to limit the number of streams per song. For example, after you have streamed a song 2-3 times, I think it should be "blocked", meaning the only way to listen to the song again would be to buy it. These services of course aren't going to do that, so how about you try it yourself? If you use Spotify or Apple Music, and if you listen to a song or album twice or more and enjoy it, take this challenge: BUY IT!